Former UN chief Kofi Annan, who died on Saturday, lashed out at the state of global leadership in an exclusive interview with AFP last year, urging more cooperation to deal with terrorism, migration and climate change. “Honestly speaking, we are in a mess,” the Nobel peace laureate said on December 12 ahead of a major climate conference in Paris. Speaking two years to the day after the Paris climate deal was agreed — and following President Donald Trump’s announcement that the United States would leave the pact — Annan remembered “the enthusiasm, the excitement and the energy that was brought to bear” in 2015. “When you walk away from a conference like this, you expect people to go away fully determined to implement, to continue and move,” he said. He expressed particular concern over escalating tensions with North Korea, warning: “One miscalculation, one mistake and we are all victims”. “It may not be a deliberate decision to start a nuclear war,” he added, adding that inflammatory rhetoric — without mentioning Trump or North Korean leader Kim Jong Un by name — was not helping. 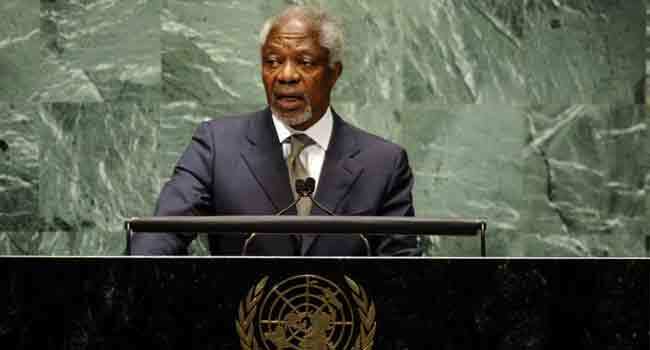 Annan spoke to AFP as part of The Elders group of senior statesmen and women. There was an outpouring of grief-stricken tributes on Saturday from leaders around the world for Annan after his foundation announced he died at the age 80 after a short illness.